As we prepare for the 2015 season, the majority of us are affected by the weather or by the Daylight Savings time change. Either way the indoor trainer becomes necessary evil. While riding indoors can be mentally taxing, there are benefits to be gained by logging time in the “sweat box”. As long as you are able to get outside once or twice every two to three weeks for a long ride, the trainer should be used for quality over quantity. In comparing indoor vs. outdoor time, there are three important factors to examine. First, doing a 60 minute indoor ride would roughly equal 90 to 100 minutes of riding outside. Why? The work is steady for the entire indoor ride. 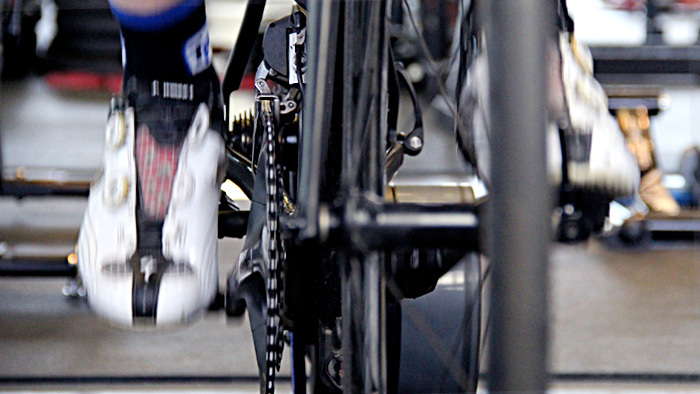 You are constantly applying pressure to the pedals; there is no coasting or stopping for lights. Given this, you may be doing 50 percent more work when riding indoors. Second, you need to consider your static position while riding on an indoor bike. Even if you have rollers with a “motion” device or a trainer that allows the bike to rock, your position changes very little. Riding outside requires adjustment over changing terrain. Your body position both in and out of the saddle changes in many ways allowing you to work different muscles. On your indoor bike, you are constantly working the same muscles for an extended period of time. This especially applies when doing structured efforts. The lack of variance in your position can cause certain muscle groups to be over-worked and others to be underworked. One caveat is that riding an indoor bike, especially rollers, can be an excellent way to smooth out your pedal stroke and to help find any dead spots in the stroke. Finally, you have to consider the mental factor of riding indoors. Even the most mentally strong individuals, will eventually reach a breaking point when riding inside. Since the trainer is such a valuable tool, great care should be taken to use but not abuse your indoor time. Use the three guidelines above to remember quality over quantity. Indoor rides should last anywhere from a 30 minute recovery ride to a 2 hour structured effort. Most rides should fall in the 60 to 90 minute range. Have a plan for your indoor training period. Ask yourself, “When do I want to be at 80-85% of fitness?” Most of us want to go into the end of March race ready and have a solid base of fitness but not bang on form. After you determine that date, you want to allow 3.5 to 4 months of indoor training in your schedule. Remember periodization. You want to work in 3 to 4 week blocks and then take 4 to 6 days of rest. Then resume training. Always: Do a 10-15 minute warm-up, a 1 X 5 at LT and at 95-100 cadence followed by a 5 minute recovery. One of the best ways to increase your LT is by doing 20 minute efforts at 92-95% of your LT. Do the warm-up as described above, then do 2 X 20 at 92-95% of your LT at a 90+ cadence. Do a 10 minute recovery between efforts with a 5 minute cool down to finish the 80 minute session. Monday through Friday: Two rides per week at 60 to 80 minute sessions. Do 1 or 2 effort days with a recovery day between. Weekends: One to 2 rides at 60 to 80 minutes per session. Do 1 effort day and 1 recovery day. Here, the interval duration is decreased but the effort intensity is dialed up. Do a structured warm up then do 3 to 4 X 10 at 100-107% of your LT at a cadence of 90 plus with 5 minute recovery between. Monday through Friday: For the first two weeks, do 1 session per week with other rides being at LT or Tempo. After an initial 2 to 3 weeks, do 2 sessions per week. Weekends: One per weekend. Other day low tempo or recovery. Here, we again reduce the interval time but increase the effort. After warm-up, do 4-5 X 5 at 110-118% of your LT at a cadence of 90 plus. The 5 minute effort can be some of the most painful intervals. Recovery time becomes very crucial here and should be at minimum 100% of effort time. Monday through Friday: Two per week with the other days being recovery or tempo. Weekends: One per weekend, with the other days tempo for 1 hour, or 2 X 20 minutes at LT. The final phase of your indoor training should be a mix of 1, 2 and 5 minute efforts. These will help peak your fitness as you approach the end of trainer season. You can do a ladder of efforts: 1-2 X 5 at 110-118%, then 3-4 X 2 at 120% and 5-10 X 1 at 120-130%. Again, recovery times should be at minimum 100% of effort time. Weekends: One per weekend with the other days tempo for 1 hour, or 2 X 20 minutes at LT. The trainer can be used to help finalize your preparation for your races, but it should not be used exclusively. Too much is gained from structured training on the road.